Businesses in the Food and Beverage industry have always raced to keep up with ever-changing consumer tastes and preferences. In this day and age it has become only too clear that only the adaptable brands will survive. Therefore, budgeting and planning is not just advised, it is crucial. Let’s explore the key 2018/19 trends, changes and challenges that will continue to impact our sector and how we can use Adaptive Business Planning to better navigate these changing times. We will also look at a couple of companies that are doing this already and how they are doing it. Purpose continues to be increasingly important to consumers with ethical and environmental values high on the agenda. Environmental concerns including plastics and packaging reduction – the emphasis on this will only increase. We have seen Walkers Crisps introducing a packet recycling campaign after consumer pressure and the government have recently announced that they hope to introduce an England-wide ban on plastic straws from October 2019. Healthy eating and drinking, particularly fuelled by the rise of bloggers and social media influencers who focus on diet, nutrition and well-being. For example, there are more low and no alcohol drink options than ever before. The focus is now more on wellbeing and sustainability than simply counting calories. Vegan and vegetarian trends show no sign of slowing down, driven by the growing demand for alternative sources of protein, the rise of social media and a growing awareness of the impact of meat production on the environment. Premiumisation, including growth in indulgent products with smaller portions, is becoming key as people are willing to pay more for their special treat. If it is ‘instagrammable’, all the better. Brexit with its wide-ranging implications on legislation, supply, tariffs, workers etc. This really is part of the great unknown right now and we must be ready to adapt as well as to have contingencies in place. Other including labelling (especially where allergens are concerned), rising costs and intense competition. No one knows everything though, and so we cannot plan for all events that may or may not come our way. But it is the companies who spot the trends early on and adapt their plans accordingly who will come out on top. We need to understand how we can keep up with, forecast and adapt to meet the ever-evolving tastes of the consumer whilst navigating through challenges that we may face. There are several different types of planning  but one that truly allows you and your business to address uncertainty in planning is Adaptive Business Planning (ABP). Through this model decisions are assessed, and risks identified at each stage of the planning process on a timely basis so that strategy can be set and modified, and appropriate actions taken. A long-term vision broken down into 3 and 5-year objectives with quarterly goals and alternatives. Planning at project and activity level. Planning involving the functional & divisional managers, with project owners. Projects with their own set of assumptions, milestones, tasks and budget, as well as a clear owner. Quarterly/ monthly reviews with the project owners and management to discuss each project and activity that make up the plan on a tactical level. Business is outward looking, focused on what is happening outside the business as well as in. Plan adjusted if required as opportunities or challenges arise. The process allows you and your business to respond quicker and to improve performance through greater co-ordination and cross functional teamwork rather than to simply set one fixed annual budget and stick to it regardless. The key is to create a tactical decision-making team at the centre of the business. This approach fosters a forward focused management culture. Opportunities and challenges should be spotted in advance, with time to adjust plans or create new ones. A forward-looking approach to running the business, which should spot problems and opportunities with enough time to mitigate or take advantage of them respectively. A regular look at the performance and milestones of the projects and activities of the plan to assess actual vs planned impact on the business. Continuous dialogue and discussion across the various functions and teams within the business. Plans that adapt to what is happening inside and outside the business. A change in mindset and approach to planning. Ongoing monthly commitment from across the business to the planning process. Who uses Adaptive Business Planning? Let’s look at a couple of examples of who is using this methodology and how. Adaptive Business Planning is not simply relevant to the F&B sector, as many well-known businesses are now shifting to this method if they have not done so already. Whilst this methodology is not new and has been around now for two decades, it is not always implemented effectively. We can learn from successes in other industries and apply what they have learned. Advocates of the process include Spotify, Monzo as well as many top FMCGs who have announced their desire to be more agile. Take Spotify, the innovative digital music service (and if you have not watched Spotify’s short videos on Spotify culture, I sincerely recommend that you do). They show us how they re-organised their teams to be able to focus on short terms goals with a focus on autonomy and team working and how they embraced a fail fast culture. Spotify sets an overarching vision and long-term goals and then empowers sub teams to focus on aligned short terms goals that can be re-negotiated every quarter. These sub teams or, as Spotify calls them, squads, have reviews every few weeks to discuss what went well and what to improve next. This full adaptive planning process means that plans can be tweaked and improved rapidly. People should quickly stop doing anything that doesn’t add value at Spotify. They have also learnt not to try to do too big projects but to break them into smaller efforts than can be completed simply and measured effectively. Spotify focuses on adapting to its environment and being agile. This includes not having a fear of failure; “we aim to make mistakes faster than anyone else” says Daniel Ek, Spotify Founder. The idea behind it is that they know that they are going to make mistakes, and this is inevitable. So, why not fail faster when they do fail? Each failure then becomes an opportunity to both learn and validate their leanings. For them it’s a strategy for long term success. “Failing is perfectly ok as long as we learn and validate our learnings! Healthy culture heals broken processes. Grow fast, change fast, be brilliant”. In July 2018, Monzo, the digital, mobile-only bank, took the brave step of making their quarterly goals public, first as an experiment, but then confirmed this October that they would continue to do so. Within this communication Monzo have highlighted their use of ABP. They also set a long-term vision and then use short term goals to shape what they will work on over the next 3 months as immediate, practical aims to help them achieve their overall mission. They recognised that start-ups change incredibly quickly. Their goals, tactics, plans and priorities are all constantly changing, so they had to find an adaptive process to match this. Like Spotify, Monzo reassess their goals within their adaptive planning framework each quarter to make sure that they are still relevant, based on both the facts at the time and the new priorities. Even within the quarter it is possible that goals are tweaked, or that they don’t end up meeting them all. This will be an active decision taken because of changes in their outlook at the time and they are firm believers in not blindly following goals just because they were set in the past. In our rapidly changing environment, it is no longer enough to simply create one budget or plan and stick rigidly to it. Businesses, whatever their size, need to learn to set a clear long-term focus, divided into tangible short-term plans and be able make adaptations to it when needed. Business planning can feel time consuming and unnecessary to small businesses combating day to day fires. However, once set up and embedded it can act as a rock, a motivator and an enabler for timely decision making that can make or break a small business. 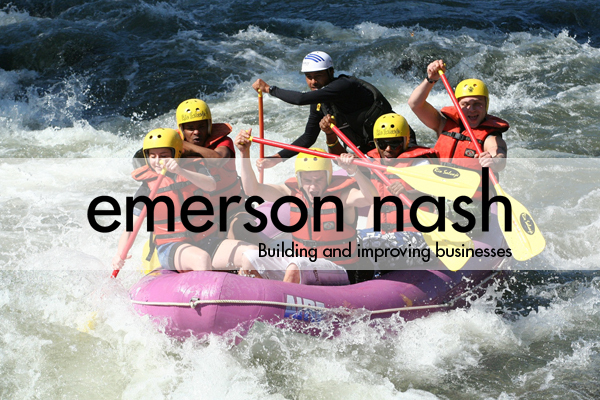 Emerson Nash helps build and improve businesses. Emerson Nash helps businesses design and improve their business models to ensure they generate as much profit and cash as possible. Our Business Model programme is delivered over a series of workshops with your team. Please call us to discuss how improving your business model may significantly improve your business results.